Before Phil Walker-Harding created the games that have made him a well-known designer -- Sushi Go, Cacao, Imhotep, Bärenpark, among others -- he designed a small box dungeon-crawling card game called Dungeon Raiders. It was published back in 2011 by HomoLudicus and distributed in the U.S. by Passport Game Studios. Seven years later, and Devir Games has released a second edition of Dungeon Raiders that has updated not only the art and graphic design of the game, but a number of gameplay elements -- most notably removing the player elimination from the game. But before I discuss those updates, let me give a brief overview of how the new edition of Dungeon Raiders plays. Dungeon Raiders is a simultaneous action selection game that plays over five rounds, with the winner being the person with the most treasure at the end of the game -- provided they do not have the most wounds, as the most wounded player automatically bleeds out and dies, or at the very least loses the game. 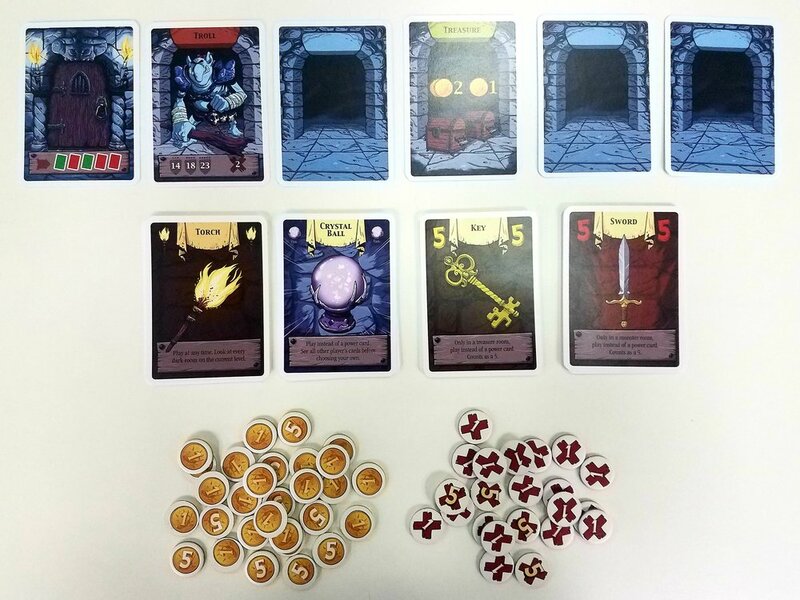 In each round, players will traverse five dungeon rooms represented by cards, facing in each of them either a monster, a trap, or an opportunity to take treasure and/or helpful items, such as torches and swords. 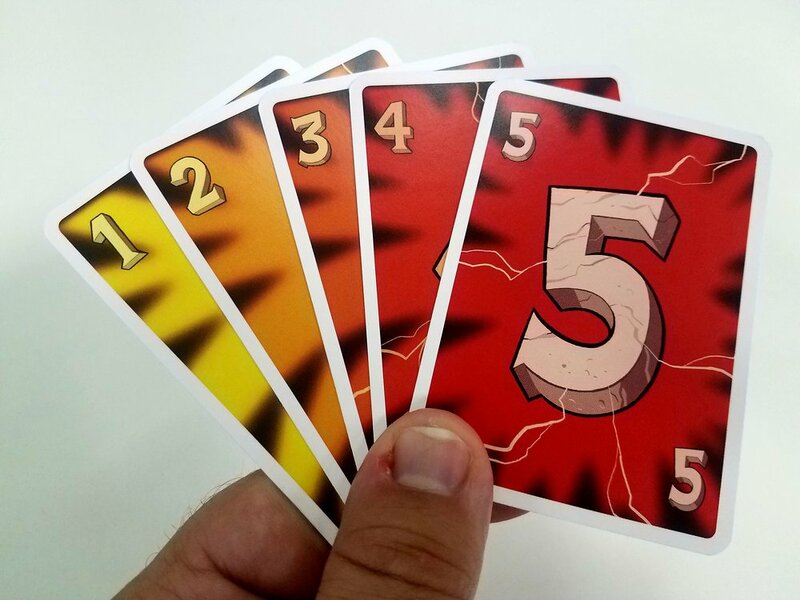 Every players’ hand of cards each round is identical, a set hand of five cards numbered 1 through 5, and each player will play one card per dungeon room. However, each character is unique, and starts with a different amount of treasure, number of wounds, and special items -- which helps keep the decisions of which card to play from being too similar. The monster cards are interesting because if players collectively play a high enough cumulative number, the monster is defeated, but if not, only the player or players that played the lowest number cards are wounded. This creates a nice tension point, as players don’t want to spend their highest cards on fighting monsters, they want to save them to gather treasure, but they also don’t want to get caught as the lowest card and get wounded, potentially eliminating them at the end of the game if they’ve amassed the most wounds. The special items inject some additional excitement and randomness, as, for example, a player can choose to play a sword to battle a monster instead of one of their numbered cards, with the sword counting as five points towards defeating the monster, and that player then having an extra card to play for the rest of the round. There is also a torch that lets a player look at all the face down dungeon cards that round, and a crystal ball that allows a player to see what everyone else has played first before playing their card. 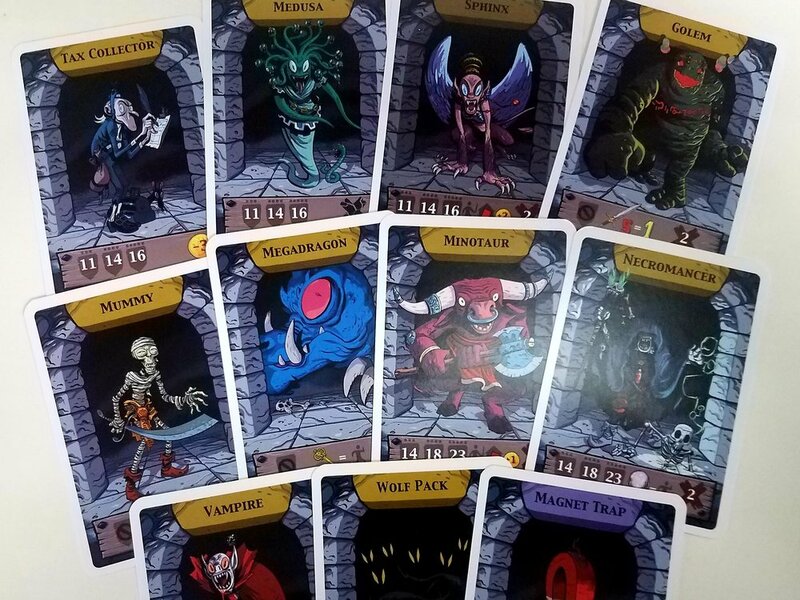 Finally, no dungeon would be complete without a boss, and the game provides eleven unique bosses, one of which will be secretly selected the last card the players must face in the fifth round of each game. The boss monsters attacks are considerably stronger than the regular monsters, meaning there is no certainty to victory until that last card is successfully handled by the players. There are only five adventurers, so in a five player game, all of the characters will be played. Additionally, most of the dungeon rooms will be used every game. However, the order the rooms come out in, as well as which rooms are face-up and which are face-down, give them game its variability. And make no mistake, most of the game’s tension comes from the uncertainty of wanting to save high cards in case the face-down rooms late in a round are either loaded with treasure or have a particularly nasty monster to face. The addition of the random boss monster at the end, from eleven potential boss monsters, helps to add to that variability. But overall, each game does have a very similar feel to it. Pros: The game plays quickly, and is constantly engaging due to its simultaneous nature. It does not overstay its welcome at the table. It features a lot of components for such a small box, and is a good candidate to be put in a Quiver carrying case. The art and design of this updated version is a big improvement over the previous version. Cons: The game is very light, so heavy gamers can safely skip it. It can feel a bit repetitive. The player count of 3-5 players can be limiting. Setting up the dungeon deck before the game is a bit fiddly and time consuming. In this new release of Dungeon Raiders we have made major changes. The wound system no longer counts down from a wound total instead players will gain wounds as the day goes on. This has removed player elimination so no player is out of the game until the very end. The dungeon set up has also changed in this new edition. No longer do players have to shuffle half the face up into the half face down. It is now based on a separate dungeon deck that shows players which cards to have face up, and which cards will be face down. To paraphrase one of my favorite movies -- it’s an older design of Phil Walker-Harding’s, but it checks out. While I missed it when it was first released in 2011, I had been looking for a game to fit this casual group niche in my collection for about that long, and failing spectacularly. Two popular games that I thought would fit this niche -- Munchkin and Boss Monster -- both fell very flat, both with me and those I played with. Turns out, Dungeon Raiders is exactly the game I wanted those games to be -- something casual, quick, and fun, that doesn’t take itself too seriously and allows for table conversation, but still has moments that provoke a good laugh or groan when someone gets the short end of an important encounter. 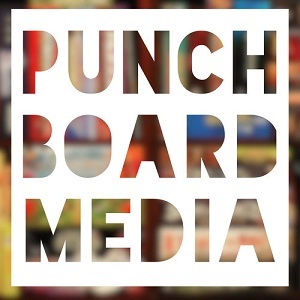 Overall, I’m a really big fan of this game and I’d recommend checking it out, as long as the lightness of the game and its three-player minimum player count don’t sour you to the idea of it. Full disclosure: I received a review copy of Dungeon Raiders from Devir Games. Apr 10 The Cardboard Hoard: Review of Gretchinz!